Double gold world champion Bernardo Faria smashed his way through the competition at the 2015 BJJ World Championships in both his weight class and the open weight division. So far in 2015, Bernardo has had 15 fights and 15 wins. He's passed every Guard he's faced - and he's gone up against the best guys in the world, including some of the legends of the sport. Truth #1 – All of the new school guards have one thing in common – The Guarder needs to pick his hips high off the mat or swing them left and right to make them work. Think about it: Berimbolo, De La Riva Guard, Spider Guard, Lasso Guard, Butterfly Guard – they all need a lot of hip mobility from the guy on bottom to work.. But... If you can figure out a way to control his hips the guy in class who is embarrassing everyone becomes just another guy who is about to get smashed. We’ve seen it happen thousands of times. Truth #2 – Old School Passes are the best weapon against new school guards. Atos in San Diego is probably the epicenter of the whole world for new school Guards. It was where the Worm guard was conceived and all the killer lower belts are rolling upside down and wrapping lapels in knots – it is a headache waiting to happen. But in a YouTube video, Head Professor and one of the greatest grapplers of all time Andre Galvao , gave a little secret to his thinking on shutting these guards down: Put your knees on the mat! Yes, if your knees are on the mat it kills your ability to run around someone’s guard and do leg drags. However, it also kills the ability for the guarder to use Lapel Guards, De La Riva, Berimbolo (for the most part), and most types of inversion. Simply put – It keeps their hips on the mat and if you pass heavy – there is nothing they can do to stop it. 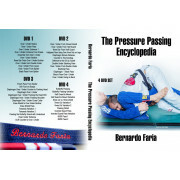 Just days after he won the World Championship in his weight class as well as in the Open Class, 2015 World Champ Bernardo Faria filmed the most comprehensive Video Series on Pressure Passing Ever Made. This is NO exaggeration. If you are sick of these guys getting under and sweeping you and you just want to smash the crap out of them – well this is the science of smashing people who want to do those cute little guards (if such a science exists). If you want to smash “New School” Guards, this is the series for you. Never has there been a more complete series on Pressure Passing. This series will make you better at Jiu Jitsu and it might just revolutionize the way you pass. What’s included in the Pressure Passing Encyclopedia video series?